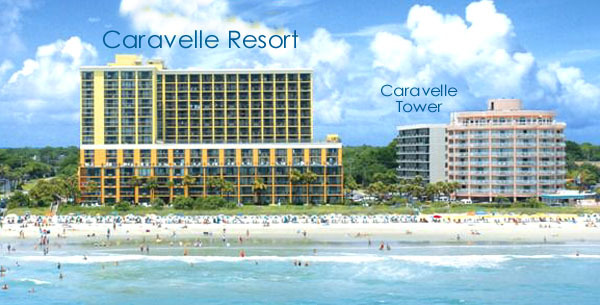 The Caravelle Resort is a very popular vacation destination on the north side of Myrtle Beach on either side of 70th Ave and Ocean Blvd, directly on the beach. There are actually two different buildings: The Caravelle Resort is a large oceanfront building on the 6900 block, and the Caravelle Tower is next door on the Blvd, with the St Clements condos behind it facing the beach. The Tower offers ocean views from some of the higher floors and was built in the 1980's. The Resort itself was built in the mid 2000's, but all the units have been renovated and updated like new. The amenities in both buildings are amazing and stretch from one side of the resort to the other facing the ocean. Owners and vacationers enjoy multiple outdoor pools, a lazy river, an indoor pool on the 7th floor, a gameroom, fitness center, hot tubs, ice cream shop and mini-mart, and an on-site restaurant/bar. A parking deck is attached to the resort side. The Caravelle Tower also has its own indoor and outdoor pools along the side. Both buildings offer 1 bedroom units as well as efficiency units with private balconies. Efficiencies have a small kitchen area near the entrance, and the beds are near the balcony doors. The one bedrooms have a separate bedroom and private bath. Most all have been upgraded with granite countertops and other luxuries. You will find a few that were customized with extra rooms or a different layout. Efficiencies run around $50-60,000, with one bedroom units from $70-100,000. The resort's more residential location in the "Golden Mile" is the best part of Myrtle Beach. It's closest to the Carolina Opry, many of the best restaurants, and the malls and outlet stores further north. If you're looking for the perfect vacation rental that is affordable and in the best location, start your search with these condos in the Caravelle Resort. Call us for more information or a tour of the available units. *The below is just a sample of the condos for sale in Caravelle Resort. Use the MLS search tool or contact us for a complete list. Listing courtesy of Myrtle Beach Realty Group , Patti Doria. Listing courtesy of Tradd Residential , Spring Haigler.